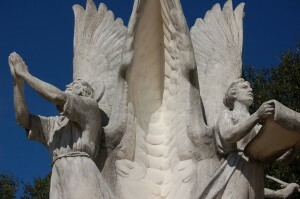 In the town of Madison, Florida, you can find the Colin P. Kelly memorial, a striking sculpture of four angels, their wings unfurled in the wind. The memorial was dedicated in 1943 to the name and heroics of a B-17 pilot whose plane was shot down just days after Pearl Harbor. As idealistic and as hard as all these freedoms are to achieve in this world, that last one maybe the hardest: The freedom from fear. There is plenty to be afraid of today, everything from terrorist attacks and spiders to economic collapse and newly harvested cantaloupes. Getting free of fear seems to be a pipedream. From where does this peace come? Better fiscal policy? More powerful weapons? A hulking stockpile of canned food, bottled water, and ammunition? I doubt it. No, the only source of peace is love. When you know you are perfectly and completely loved, there is nothing left to fear, for perfect love dispels all fear. The Apostle Paul once asked a rhetorical but significant question: “Can anything ever separate us from Christ’s love?” In other words, will God’s love for us really last? Can we count on it in face of multifarious threats and dangers? When the world seems to be flying off its axis and the fabric of everything we ever trusted is in shreds, will God’s love be there for us in the end? The answer is an emphatic “yes!” With some of the more magnificent words in the Christian Scriptures, Paul responds to his own question with a comprehensive list of possible dangers: Trouble, calamity, persecution, hunger, destitution, threat of murder, violence, life and death, angels and demons, fears for today and worry for tomorrow, the power of hell, powers above and below – it is as broad and as exhaustive a list as one could construct. And then he concludes, “Nothing in all creation will ever be able to separate us from the love of God that is revealed in Christ Jesus our Lord.” Nothing in this life or the life to come; no spiritual powers, good or evil; nothing in the present moment and nothing tomorrow; nothing now, and nothing later; the powers that be – governmental, spiritual, judicial, religious, economic, earthly or otherwise – none of these have the power or ability to take God’s love away. It is sure. It is strong. It is eternal. It is ageless. It will not wax and wane. It is the one unvarying element in the cosmos, able to overcome everything, including our fears. If the created universe can contain it, God’s love can outlast and defeat it. This includes the worst of your sufferings, the worst of your personal failures, the worst crimes you have committed, the worst of your decisions, your divorce, drug abuse, emotional baggage, arrest record, selfishness, adultery, rebellion, addiction, dishonesty, stupidity, your bone-headed decisions – fill in the blank – nothing can separate you from God’s love. That will set you free from fear.